Poland: What future awaits the unwanted giant? Understanding the context of Stadion Śląski isn’t easy. In fact, many people in Poland have trouble grasping the never-ending story of its reconstruction. So let’s go back to the beginning, 1993. At that point Poland, early into regime transformation, had nearly no funds for sports infrastructure. In that reality authorities along with the Polish football association decided that this is the stadium most suitable to become Poland’s national one. In simple words: it was the only large stadium that offered floodlighting and would take reasonably little to modernise. The below photo is from 1960s, but it's nearly the state in which Śląski was in early 1990s. Reconstruction began in 1997 by addition of a modern east grandstand and… hasn’t ended to this day. Gradual works were expected to make it a hub for various sports and many football games, including the national team and clubs from Upper Silesia, the region with (by far!) most championship titles and honoured clubs. The sports landscape began changing in early 2000s, when Poland entered the EU (2004) as a rapidly developing country and won rights to hold Euro 2012 along with Ukraine (2007). Stadion Śląski was initially almost certain to hold the tournament, but eventually failed to make the shortlist. This proved to be a lucky selection, because in 2011 a disaster occurred, when its new cable roof snapped during the ‘big lift’. First accident of its kind caused the project to be halted and still ongoing. Last structural elements of the roof will be installed next week, while overall opening is planned for mid-2017. 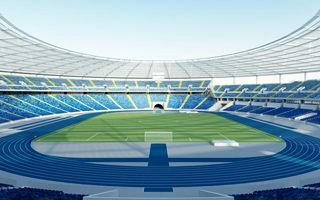 By that time Poland will be a country with not only a new national stadium in Warsaw, but one with over 30 other new stadia built since Śląski’s redevelopment began! Aside from the final budget of this project (still unclear), the crucial question includes what will actually happen to the stadium when it reopens in a new reality. Polish Football Association (PZPN) no longer considers Stadion Śląski their home and signed long-term contract to play all competitive games at PGE Narodowy. The best Śląski could hope for is a friendly game once a year, if even that (competition for hosting friendlies is huge). There were even appeals not to deliver Śląski after the 2011 catastrophe, rather leave it unfinished or even tear down. But it seems the future isn’t as dark as it might seem. Poland’s new sports minister Witold Bańka suggests using the building as new National Athletics Stadium, because it will be the only Polish venue able to hold the grandest international events. Focusing on athletics is a reasonable way to go, but it won’t bring the crucial revenue. Thus serious lobbying began a couple years back to bring Poland’s 14-time champions Ruch Chorzów to the stadium. This week Ruch president Dariusz Smagorowicz confirmed his club will move to Śląski in 2017 if negotiations end as planned. But Ruch’s move is extremely controversial. Many fans cannot imagine leaving their spiritual home at Cicha 6, especially that the city of Chorzów is about to rebuild that venue into a modern 12,000-seater. Ruch averages 6,000 per game and only managed to draw 7,000 per game in 2007-2008, when the club was forced to use Śląski temporarily. That’s under 20% of the capacity (! ), which may be why regional authorities are considering subsidizing the games. It also means that Ruch will not bring the revenue needed to cover running costs. Current estimates of the Regional Government suggest that running at an annual loss under PLN 10 million ($2.5m / €2.3m) will be regarded as a good result.